Bourgas, 17 Konstantin Fotinov St. Location: Hotel Fors is situated in the centre of Bourgas, in very close proximity to important business office buildings, the airpoirt, the railway station and the seaport of Bourgas. The hotel offers excellent opportunities for business tourism, as well as for relaxing holiday at the seaside. It is only 250 metres away from the central beach of Bourgas. 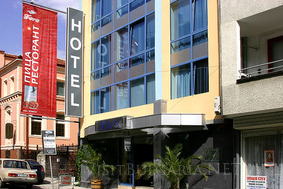 Accommodation: The hotel offers 20 roooms and two apartments. Each room has air-conditioning, satellite TV, direct telephone line and minibar. Wine & Dine: A nice cosy pizza-restaurant with 70 seats capacity and a beautiful summer garden are at guests' disposal. Services: The hotel offers additional services, including dry cleaning and rent-a-car. There is an underfround parking lot for the convenience of the guests.